Most of the projects shown during Show & Share at our guild meetings center around quilty items. 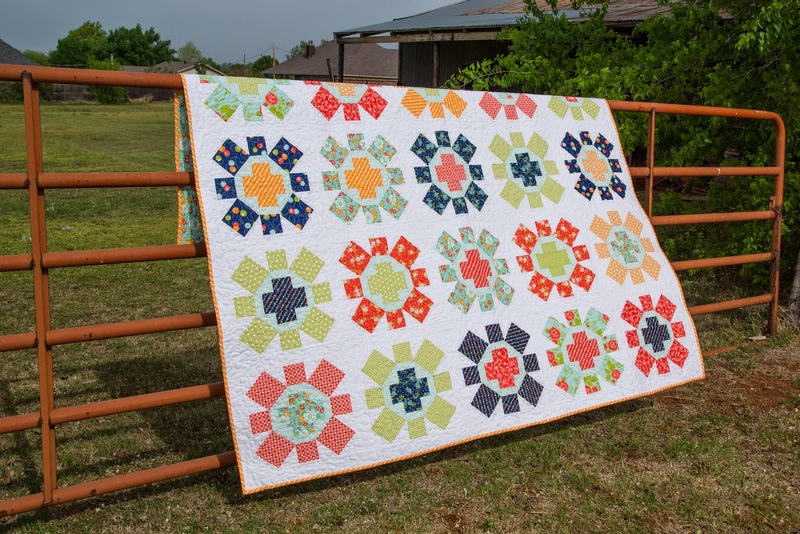 Flaunt Your Finish gives our members a chance to share completed projects that they might not normally bring to a guild meeting. I always love to see the many and varied talents of our members. With every Flaunt Your Finish, YOU are invited to link up your blog or Flickr page and show us your own completed projects. 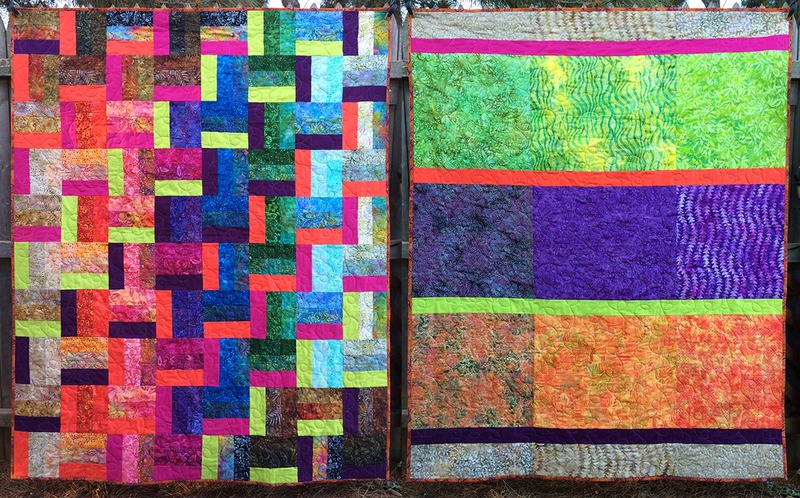 Ann was thrilled to have tangible finishes this month, especially since she started her quilts 7 to 16 months ago. "It's good to get things out the door!" 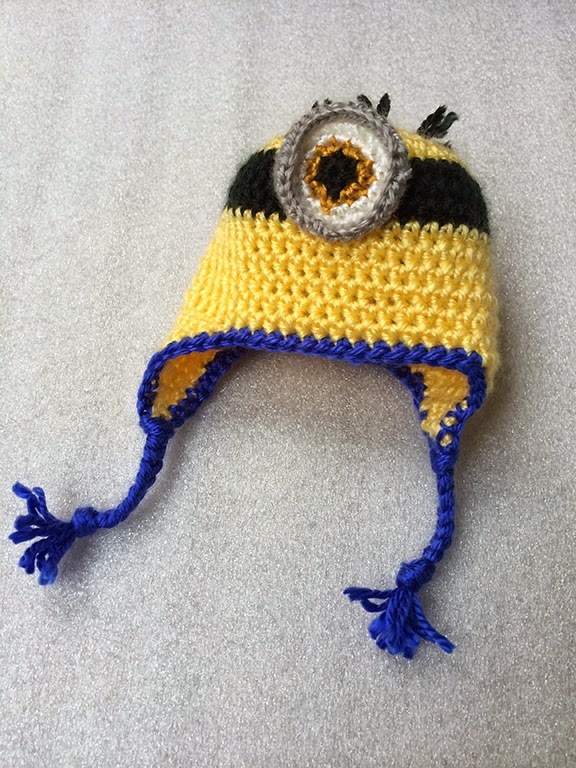 First up is her "Despicable Me" Minion hat crocheted for her new grandson, William. "I forgot to stitch on the smirk. Oops!" 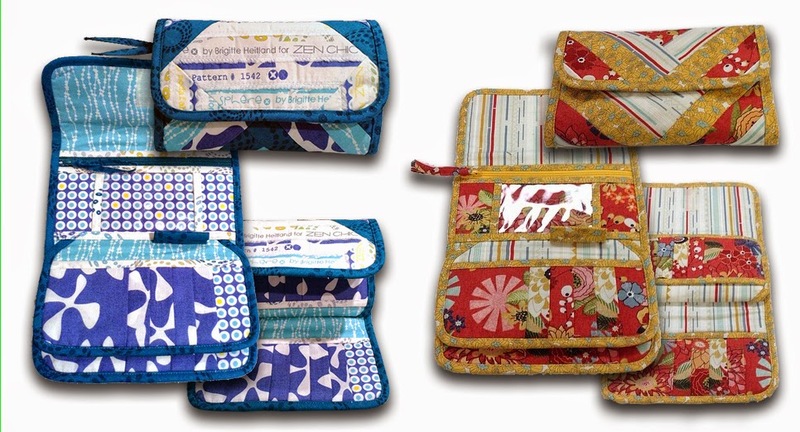 Ann's next project was these great wallets. She tried this wallet pattern for the first time after "a friend of mine inasmuch dared me to do one on my own (Zen Chic Sphere fabric) OR pay to take her class. Ha! Making them is habit forming, so I made another for a gift (PB&J fabric). And will make others. I am thinking about doing this for my Michael Miller Challenge." 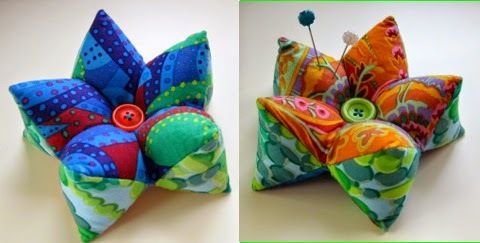 Then, Ann made these mini-charm square based pincushions as gifts filled with crushed walnut shells. He first Kaffe Fassett project, and she's bought more KF fabric for another project! The is the last quilt top Ann started before visiting (and joining) OKCMQG early last year! It's made from Kapalua Batiks jelly roll and some solids. She finally finished it to donate to "TeamGage" charity auction to benefit leukemia/lymphoma research. The pieced back helped use up some of her batiks stash. 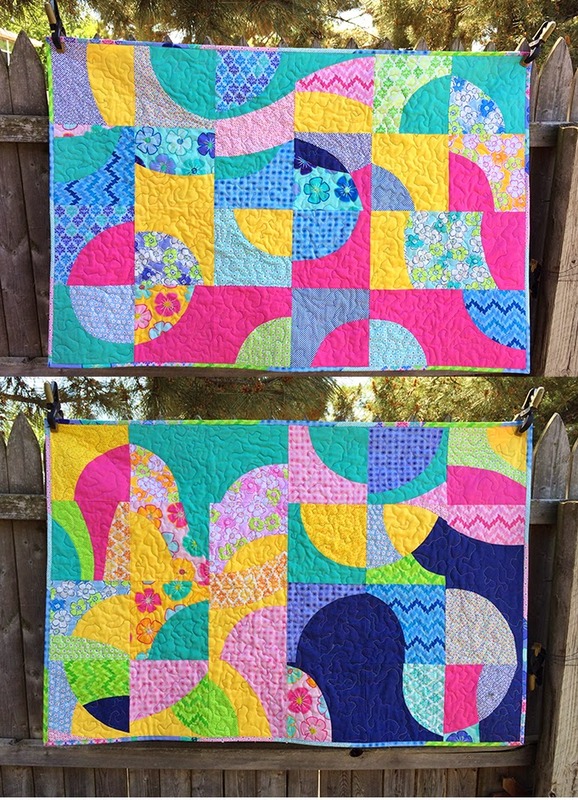 Graciously and beautifully quilted by fellow member, Agnes! And if you can believe it...Ann has one more finish! I wish I could be this productive! Also being donated to the "TeamGage" charity auction, Ann started this in last fall's Improv Curves class. "Thanks to Shirlene Davis for the moda Giggle layer cake! I'm lovin' the pieced binding. I braved quilting it on my home machine so I should call it Herky-Jerky! Bon voyage!" At last month's guild meeting, Agnes presented a fabric printing how-to. After our printing workshop, she felt very inspired by everyone's enthusiasm and excellent ideas...so...Agnes went in to do some more stamp-caving. 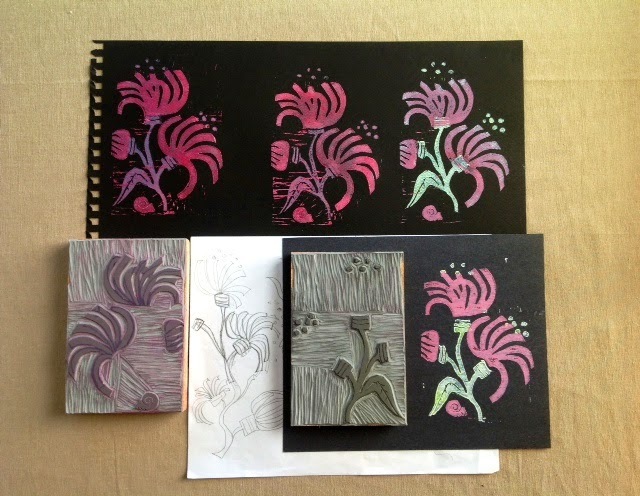 Her target was to come up with a 2-color stamp sequence that would allow for a more colorful print. "Easier said than done- specially if you have no prior training like myself! Many YouTube video tutorials later I now have a (halfway decent) stamp duo of "Dancing Dahlias". Caution, stamp carving is extremely addictive!" Wow! Kristine is proud of these dresses that "actually got done in time for Easter!" Her daughters loved them! They fit, and they look great. The pattern is Simplicity 1456. 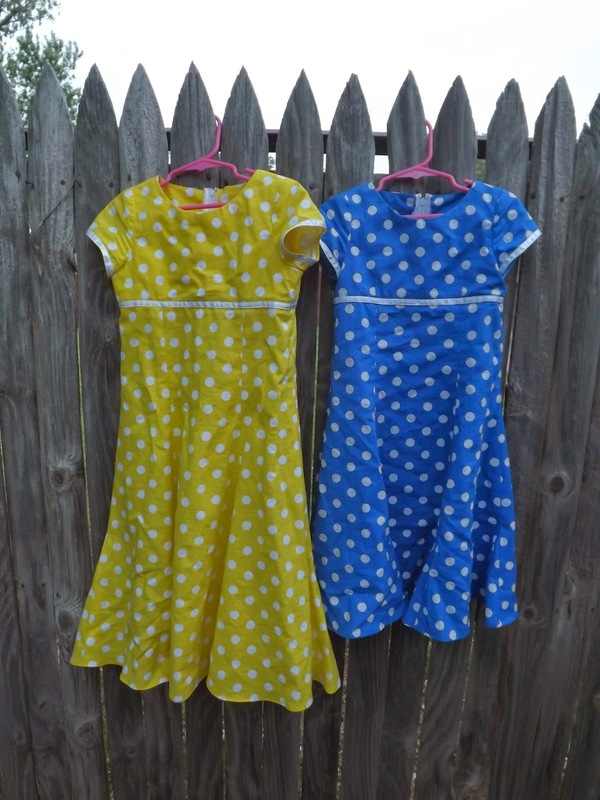 We love the large polka dots! 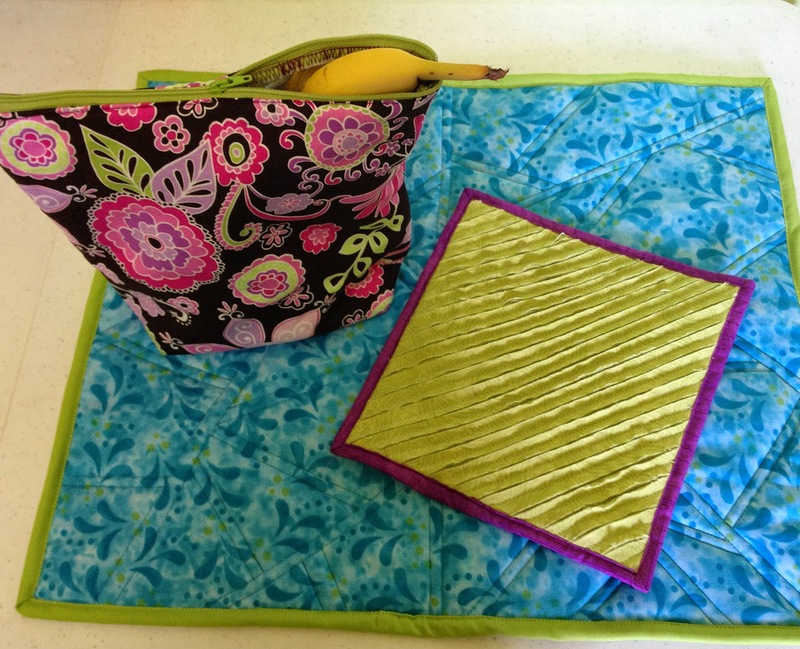 Teresa made these cute items that make use of Warm Company products – they are samples for Quilt Market later this month! The lunchbag has insul-shine and warm & natural, the lapmat has insul-bright and warm & natural, and the potholder has a double-layer of warm & natural. She used a chenille blade on the potholder, but hasn’t washed it yet. The magic will happen when she does! My mom and I made this quilt as a wedding gift for my niece who got married in January. Mom pieced and I quilted. I definitely got the easier end of the deal. What finish do you have to flaunt? Link up your project below!